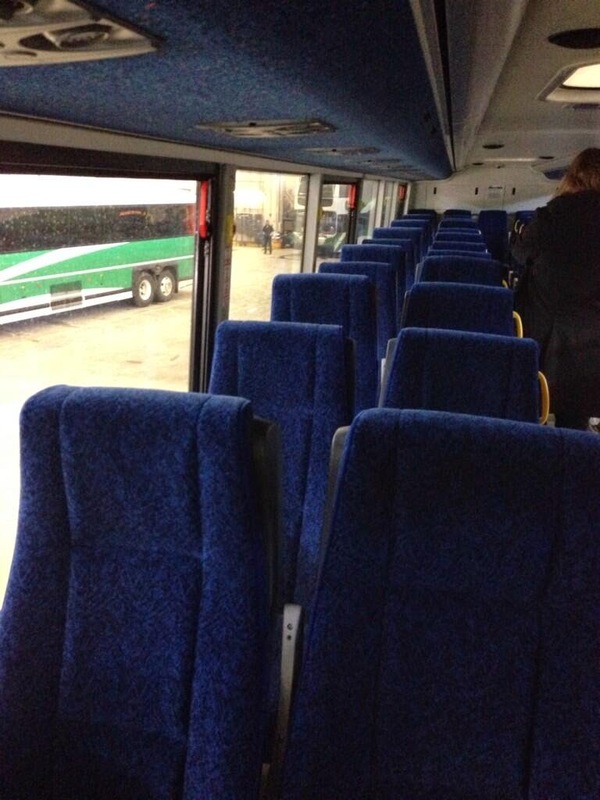 In this installment, I look at GO Transit’s real-time bus information technology. 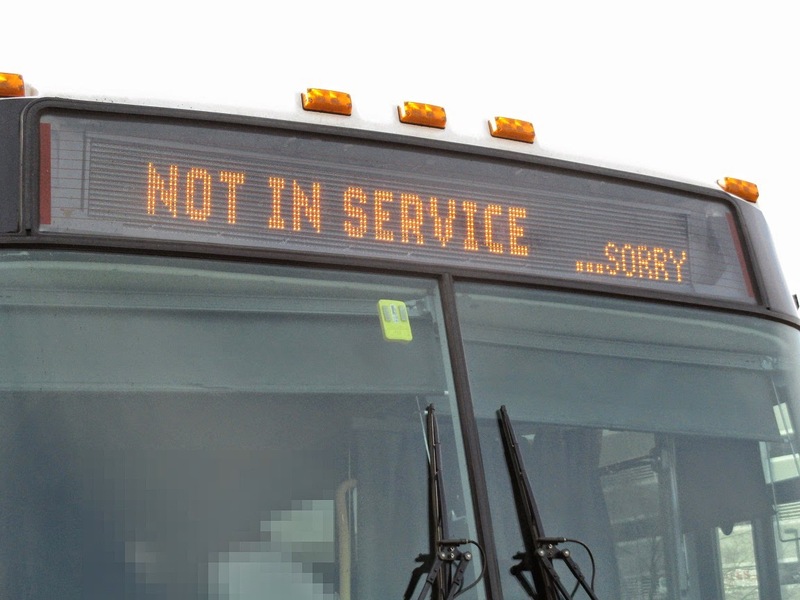 Have you ever been at your stop and had the bus arrive displaying the following signage? What is it? It’s the Computer Aided Dispatch / Automatic Vehicle Location (CAD/AVL) interface, which can make a driver’s shift a living hell. 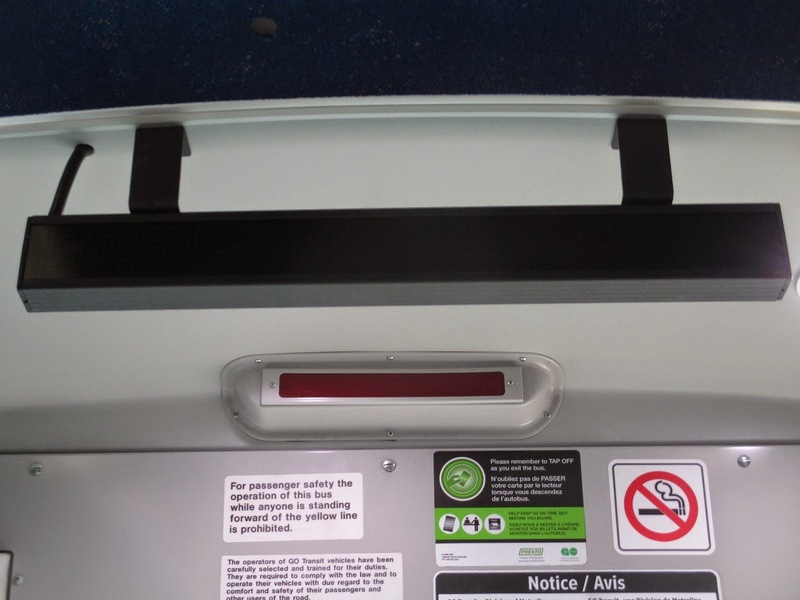 On double-decker buses, it’s installed into the overhead dashboard. 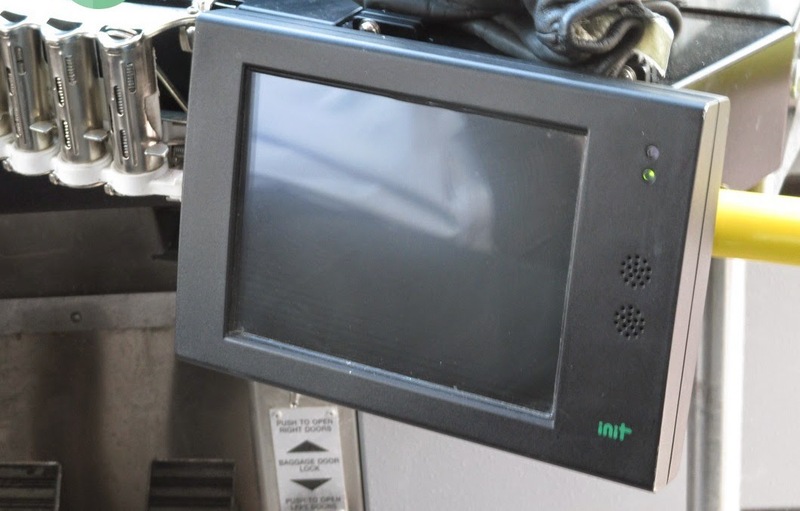 On MCI buses, it’s installed on the same support as the PRESTO POS terminal and the coin till. The coin till was moved back onto a plate and now resonates noisily with the vibration of the bus. What engineer came up with these design mods? One of the new developments that we are excited to let you know about is our new real time trip information program: During the past two months GO Transit has been piloting automated bus stop location signs and announcements on our buses. We're testing the system on Routes 12 and 16 and once this work is completed we will roll out the system to all of our buses. The modus operandi at this facility is apparent, and it speaks volumes why there is no impetus to complete the CAD/AVL project. It also fuels suspicions why there are repeat equipment failures that cause stress for passengers and drivers alike. Specific to your concern about the consistency of On the GO alerts, I appreciate you bringing this to our attention. Our investigation revealed that the delay on August 23rd wasn’t reported internally, which is why an alert was not sent. We recognize that consistent communication is essential to keeping passengers informed and we will be introducing a system that automatically notifies us of all bus delays in real time. The system is expected to be in place by January 2014 and we trust that you will see an improvement in the consistency of alerts being sent out. In the meantime, we will continue to work with our Operations team to ensure all delays are reported. We are nearing the middle of June and there is no new system that “notifies us of all bus delays in real time”; the shortcomings of Operations (GO Transit Control Centre) in this area remain. Meanwhile, St. Catharines Transit, with pockets far less deep than GO Transit, has CAD/AVL fully functioning on their buses; their real time bus information system was reported on previously. Who is responsible for this lack of progress at Metrolinx? On the 90 almost all of the buses -- MCI and DD -- all have that overhead stop sign installed. On the 90, I have seen the actual device display route information and shows the upcoming stop. When I asked if this meant that announced stops were coming (back in March), I was told, "they were in test mode". I then said my seeing-impaired neighbour will be thrilled to learn this. He's now really disappointed, especially after I read him this report. This is what fuels the negative feelings/thoughts/what-have-yous about the union. I do realise that everyone could have been on lunch at the time the photos were taken, but this only affirms my beliefs in unions. I think the time for unions have passed. At their inceptions, they did a lot of good for the people. However, since the introduction of labour laws, they are not needed and instead are seen as grasping, greedy entities. I don't think it's fair to attack the union for the shop photos. If no one is around working on those buses, it's probably because management has directed them to be working on something else. Or perhaps there are only a handful of employees working in that facility on any given day. This is a still photograph capturing a brief moment in time. Who are we to say what was going on just before/after the photo or for the rest of the day, week or year for that matter? As for the fellow with his hands in his pockets, same thing applies. Maybe he’s waiting on instructions, or for a supervisor to come back and continue a discussion they were having. Maybe he’s waiting while his coworkers finish up something they need to complete before he can get to his work on that bus. Geez, if you caught me in a photo at my desk in the middle of a blink, I’d appear to be sleeping on the job. Has nothing to do with me being unionized or not. It’s all about the context that a photo doesn’t capture. There was no blaming the unions. In fact, I admitted it was a moment in time that people could have been elsewhere. What I said was that it is photos like these that fuels the negative. You never see photos of a busy shop, only people standing around doing nothing. Context is everything. In this context, there is nothing getting done. This doesn't help the image that Unions currently have. Had this been a private garage, I would have said the same things: mostly along the lines of "how much are they being paid to stand around doing nothing". Union talk is like politics. You will never change perceptions of people commenting. As a participant in the first INIT demo/feedback run, I'm not sure you'd want it turned on yet. It announces the stops after it's already passed them. It announces everything twice (French and English, even if it's a proper street name). The "automatic calibration" to the ambient noise on the bus? Doesn't work. I realize GO's hands are tied on the English/French thing (which is beyond silly if you ask me; do STM busses announce in English? ), but unless there have been major changes over the past few months, INIT is going to need a lot of work. I didn’t intend for the photos to start a union-bashing session. They are but a few pieces of a much larger puzzle. I’d heard uncorroborated stories that the Streetsville facility has too many idle hands even though there are plenty of vehicles that require maintenance. The photos (note plural) on Twitter lend credence to that criticism. Regarding the real-time bus information system, in some cases where the internal PA system no longer works, drivers have discovered the internal/external speaker switch had been rewired backward. Are wiring diagrams that difficult to read? I saw this post on Twitter last week: http://bit.ly/1joKGEl I've been on other new DD's with this same problem. 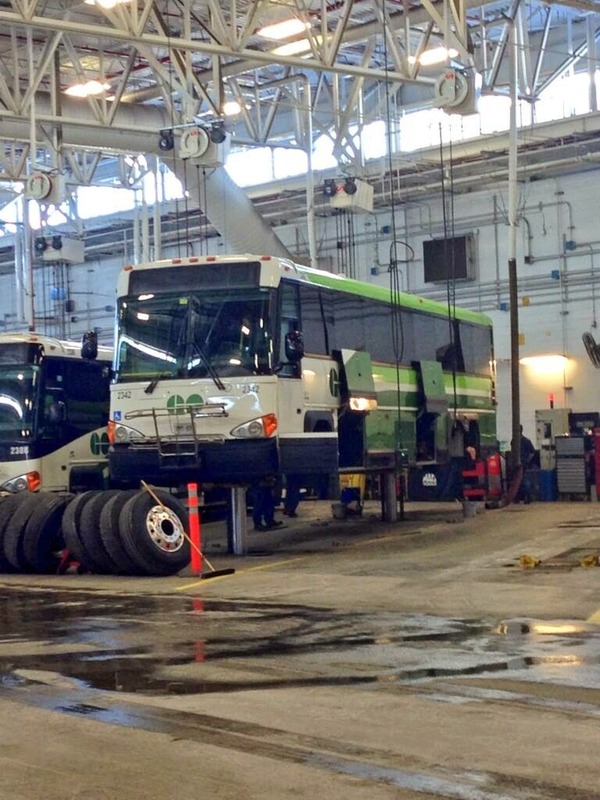 Why is the Streetsville garage putting brand new buses on the road with these obvious defects? If the nonessential systems are not being maintained properly, what confidence do we have in the safety systems? YRT/VIVA use the init system and it has been nothing but trouble. Sure they have a cool function on their website that allows you to see where every in service bus is currently located in their service area. But their screens go down often at stops and sometimes a phantom bus goes by (i.e. the clock counts down to "due" and nothing arrives) then the clock recalibrates for the next bus. Meanwhile riders are left dumbfounded as to where the bus went that was supposed to be there. I've checked with others waiting at the same stop as me to see if I missed a 60 foot articulated VIVA Blue go by. Announcements on the buses are in English only (which is fine) but also often go down. Each driver on YRT has to login and logout. This adds time if, midroute, the drivers need to switch. OC Transpo in Ottawa has another system that seems to work well and is now integrated into their phone system and real time information fed into scrolling tv screens at major stations. The drivers also do not login or out when switching buses from what I've seen at Hurdman Station (one of the major hub stations in Ottawa). The system does do English & French pretty well as is needed in nation's capital. Not sure if Init is a Metrolinx push or not. Would be interested to know what the TTC has for their system. Init though is as about as good as a Presto Card in implementation so far as I can tell. Well GRT uses INIT and it seems to work pretty well (better than YRT, anyway). INIT won the tender for this system, so they've got to live with it. Enter Streetville at anytime of the day and you will always find .... No one! A lot of frustration from other Union Members towards these invisible mechanics. GO operates 24 hours a day, so do there Drivers, unfortunately the mechanics work at a snails pace and all take breaks and lunch at the same time as one another.